The Tadoba Tiger Reserve, located in Maharashtra, India is a major attraction for the true wildlife enthusiasts. It is known to be the home of the truly magnificent and majestic Royal Bengal Tigers. The Royal Bengal Tiger certainly is one of the most beautiful creatures ever known to man. They are mostly found in India and in Bangladesh. The majestic Panthera Tigris is found even in Myanmar, Bhutan, Southern Tibet and Nepal. The hot deserts and also the cool and wet grasslands are their natural habitat. Even though a large number of them are known to exist, they are facing a high risk of getting endangered. There are around 2,500 of this tiger subspecies still surviving in the world. India has come up with Tiger Reserves since the 1970s and this has really resulted in maintaining or stabilizing the numbers. However, poaching in recent years seems to be jeopardizing the life and safety of the big cats once again. Here are some interesting facts about the most spectacular and powerful creations. 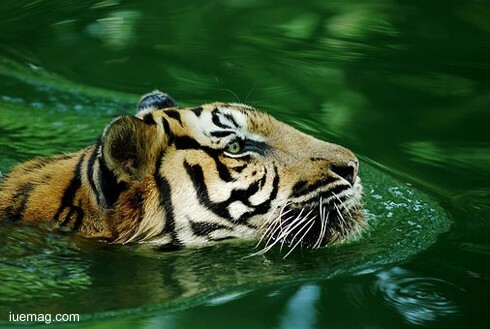 The Royal Bengal Tigers seem to be solitary animals and are often spotted in mangroves, swamps, and grasslands. These are solitary animals but they are usually, known to come together for the mating season. However, at times, you could spot tiger in groups of three or even four tigers. There are many good Tadoba national park resorts for tourists. You could stay there and enjoy an exciting wildlife vacation with your family and friends. No wildlife vacation would be complete without a jungle safari. If you go on a Tadoba jungle safari, it is quite common to experience a safe encounter with this majestic animal. Tadoba National Park boasts of highest Tiger Sighting Index and you may come across a fully-grown male Royal Bengal Tiger. You would be simply mesmerized by its sheer size. This big cat could be growing up to nine feet long if it is a male and the tigress could be attaining around 8 feet in terms of length. A male tiger would be weighing up to about 420 pounds while its female counterpart would be weighing only about 310 pounds in comparison. The Royal Bengal Tiger is a true powerhouse. They have a really powerful body structure. They have immense power and the ability to drag a prey for as much as a mile even if the prey is relatively heavier than their weight. They are enormously powerful. These majestic creatures are known to have the longest canines among all other meat-eating animals. They have canines as long as 4 inches and these are supposed to be larger than even the ones possessed by the lions. They boast of retractable claws that help them in climbing. They have exceptional vision and outstanding hearing ability. These tigers are obviously, highly-trained. They are competent in catching a prey and trained well to kill and finish off a prey. When a tiger launches a power-packed attack, the prey stands absolutely no chance to run away. The tiger would be breaking the captive’s spinal cord or gripping the throat so tightly that the captured animal would die. The magnificent and powerful Royal Bengal Tigers are quite bulky so they are not naturally adept at climbing trees. However, while pursuing the prey, they would not think twice about climbing up a tree. Although these big cats seem quite lethargic, sleeping and resting all the time, once they spring into action, nobody could beat them and they are able to cover huge distances, marking and protecting extensive territory that may extend to as much as 200 sq. miles. Bengal Tiger population currently comprises 2,500 tigers. This is much less than even 50 percent of what actually it was about a decade ago. This is pretty alarming. As such, a very effective protection plan has been chalked out. All these concerted endeavors are working wonders but poaching seems to be a perpetual concern and a hard reality. Bill Williams is a wildlife photographer and a blogger.